As the Tour de France finally reaches its first rest day, Vincenzo Nibali already has a tight grip on the yellow jersey. His closest competitor Alberto Contador was forced to withdraw after crashing on a soggy stage ten, allowing the Italian to romp to victory atop the Planche des Belles Filles and recapture a commanding lead at the top of the general classification. There’s little doubt that the day’s big talking point was Alberto Contador‘s (Tinkoff-Saxo) abandonment, which occurred around halfway into the stage on an uphill section. He suddenly appeared through the hazy drizzle and crackle of mountainous TV breakup bent over his frame, his fluorescent jersey blackened by the fall. Medical assistance was quickly on hand to strap his wounded knee, though it took an ominously long time for El Pistolero to be strapped up. Seconds turned into minutes, and a hesitant peloton quickly gained a five-minute advantage. He eventually got back onto his bike, though he clearly wasn’t riding smoothly. After a few whispers at the window of the team car and a rueful embrace with teammate Michael Rogers, he climbed off and into the car. Only later did it emerge he’d ridden 20km with a fractured tibia requiring surgery. Ouch. Initially Astana looked like they were waiting for Contador, but it quickly became clear he wouldn’t be able to bridge the gap. That saved Astana an awkward dilemma, as they could ill afford to allow escapee Michal Kwiatkowski (Omega Pharma-Quick Step) too much time out front. He’d turned his white jersey into a virtuel yellow one after breaking from the peloton with his teammate Tony Martin and, unlike Tony Gallopin (Lotto-Belisol), who’d taken the maillot jaune on yesterday’s stage, Astana weren’t too happy about such a threat gaining time. The breakaway was a fairly sizeable one, though as the final climb begun, only Kwiatkowski and Joaquim Rodriguez (Katusha) remained out front, and their gap was reducing quickly. Purito made a bid for solo victory and swiftly dropped his Polish companion, though his legs were tired from his scraps over the points atop the day’s categorised climbs. When Nibali made his move out of the bunch, Rodriguez couldn’t put up a fight. Nibali bridged the gap and sailed straight past the Spaniard, winning the stage and reclaiming the yellow jersey. 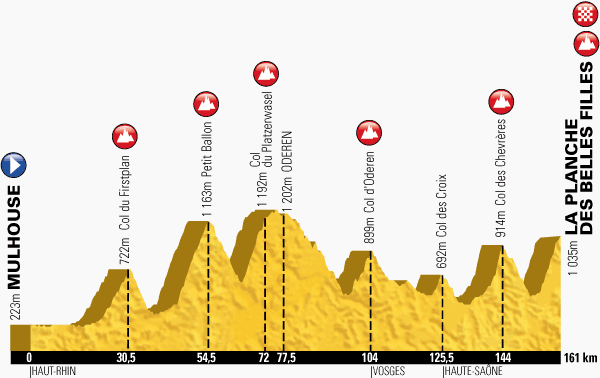 Suffice to say, with tomorrow the Tour’s first rest day, there’s still a lot of racing to go. But it is clear that there’s no one in the race remotely close to competing with Nibali in the mountains. Barring a mechanical, crash or any other disastrous occurrence, the general classification has almost certainly been decided. 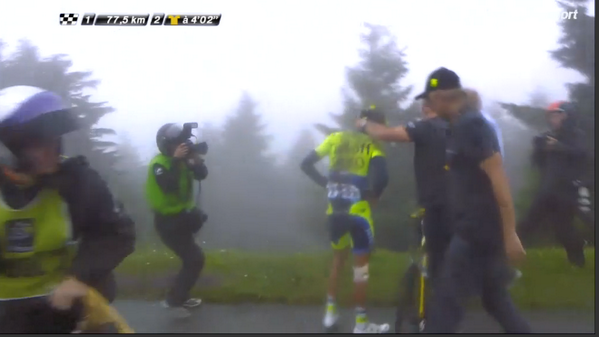 That’s not just sad for Chris Froome (Sky) and Contador, but Nibali too. Of course, it’d be unfair for the abandonment of Froome and Contador to devalue Nibali’s success at this race. Staying on your bike in horrible conditions is as much skill as luck, and the Shark of Messina is famed for being an outstanding wet weather rider. But it’d be understandable if he’s not overjoyed at the demise of his biggest rivals. Just as we’ve been denied a brilliant spectacle, Nibali’s been denied the chance to emphatically prove he’s the best around. It’s an unfortunate turn of events for all involved. Joaquim Rodriguez‘s first days at the Tour de France were pretty awful. Purito was dropped on climbs he should have been conquering, and haemorrhaged over 20 minutes on stage five’s cobbles. However, he’s re-evaluated his goals and found some form, and has been rewarded with the polka dot jersey. It’s a prestigious prize he’d be more than worthy of winning, and we can no doubt expect to see him continuing to chase points for the remainder of the race. Points leader: Peter Sagan (Cannondale). King of the Mountains leader: Joaquim Rodriguez (Katusha). Best young rider: Romain Bardet (Ag2r La Mondiale). Previous PostWho is Tony Gallopin?